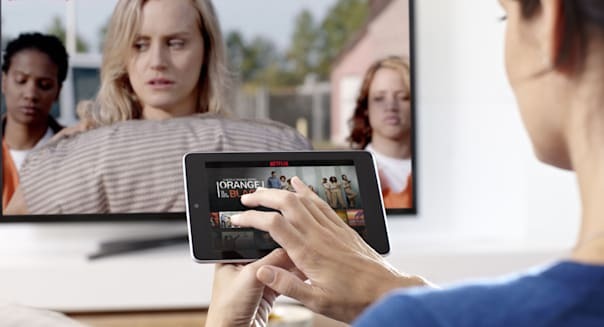 When it comes to premium streaming video services, the rich just keep getting richer. Netflix (NFLX) closed out its latest quarter by topping 50 million streaming subscribers worldwide as of the end of June. Netflix is still growing, and there's plenty of potential for a company that can divide its programming costs by more than 48 million accounts (2 million have free trials). It also makes it that much harder for anyone to catch up. Netflix closed out the quarter with 1.69 million more subscribers than it had when the quarter began. This may be less than the more than 4 million users that it tacked on in each of the previous two quarters, but this is still impressive for several reasons. Netflix was only forecasting to be at 49.8 million streaming subscribers by the end of the quarter back in April. There's seasonality here. This is historically Netflix's weakest quarter in terms of net adds. A year ago it scored just 1.29 million net additions during the second quarter. Netflix grew at a better than expected clip despite increasing its monthly rate to $8.99 a month for new users starting in May. That last point is important. Netflix's decision to increase its prices for new accounts could have resulted in a decline in signups. However, its decision to grandfather in existing subscribers at the original $7.99 a month rate probably kept many users from bailing out. Instead of canceling at the end of "House of Cards" and renewing when "Orange Is the New Black" comes back, Netflix viewers are likely to be sticking around. However, even with that welcome dynamic likely keeping churn in check, growing its net additions by a lot more than it did a year earlier during the same period is pretty impressive. After all, the second quarter of last year was when "Orange Is the New Black" debuted and "Arrested Development" made its triumphant return to television. Netflix is surprisingly modest about its success. It made it a point to emphasize how there's plenty of room for other platforms to carve out cozy livings serving up premium video -- if they can carve up enough proprietary content. "In the end of the day, there may well be room for several of these services in the market," CFO David Wells said on Monday. %VIRTUAL-article-sponsoredlinks%That may be true, but it's hard to compete in the digital smorgasbord business with a weak buffet. Netflix had a whopping $7.7 billion in streaming content obligations outstanding as of the end of June. This is money going for movies, TV shows and -- more recently -- original content. Who is going to be able to top that? Amazon.com (AMZN) is as close as Netflix can get to a rival standalone streaming service, unlike the cable, satellite, and premium channels that offer online access to paying subscribers. Amazon has been known to do a lot of crazy margin-chomping moves to gain market share, but do you really think it has $7.7 billion to set aside to beef up the video service that it offers at no additional cost to Amazon Prime members who are there mostly for the free two-day shipping? Set aside Netflix's shrinking DVD rentals. Netflix is now topping $4 billion in streaming revenue over the past year. It's just scratching the surface overseas, with France and Germany as its next two expansion markets later this year. Competitors will score some victories like Amazon did with "Downton Abbey" and older HBO content, but they're not going to gain the same kind of traction with original content the way that Netflix has done because studios know that Netflix is the place where they get paid well and noticed. Receiving 31 Emmy nominations earlier this month -- more than double last year's tally -- will do that. Netflix is where content makers want to be and where content watchers have to be, and that's something that a company doesn't lose when it's winning. Motley Fool contributor Rick Munarriz owns shares of Netflix. The Motley Fool recommends Amazon.com and Netflix. The Motley Fool owns shares of Amazon.com and Netflix. Try any of our newsletter services free for 30 days.